Over thirty years later, despite a tragedy that was to cut them off in their prime, they are enjoying a larger audience and more influence than ever before, with a profound legacy that resonates fiercely in today’s heavily manufactured pop culture. Featuring the unprecedented participation of all the surviving band members, this film examines the band’s story through never-before-seen live performance footage, personal photos, period films and newly discovered audiotapes. A fresh visual account of a unique time and place, this is the untold story of how four men transcended economic and cultural barriers to produce an enduring musical legacy, at a time of great social and political change. 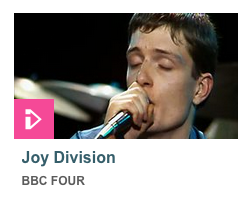 via BBC iPlayer – Joy Division.